Simplicity. Our game is very complex. But equally, many aspects can be broken down into small bites. Discreet elements. I am confident that the “5 Keys” format will speed your acquisition of these (and other) tennis skills. Each course is broken down into 5, sometimes a few more, key lessons. Under each course, like my other ETI Products, you can comment or ask a question and I or Antony will get back to you with an answer. One other note. When learning or performing just about anything, we can reference outcome (what happened) or process (how we performed). Always, always, always pay attention to process – and when done the outcome will take care of itself. Our game is very complex. But equally, many aspects can be broken down into small discreet and easily applied bites. 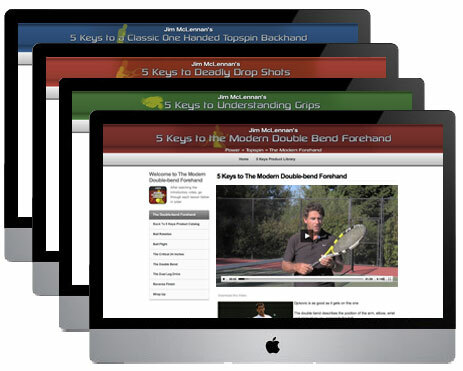 I believe and in fact guarantee that the “5 Keys” format will speed the acquisition of your tennis skills. You can purchase both modules and save or purchase each module as a package of four lessons, or you can purchase selected lessons from any module. Simple. Applicable. And at a darn good price and all come with my 100% money back guarantee! If you’d like to read more I’ve provided details on each of the courses below so you can choose the one(s) that you think best suit your needs or click the button below to get started immediately. My guarantee is very simple. Within 30 days, if you are unsatisfied for any reason, you will receive a courteous and prompt refund. No questions, no receipt required, no fine print, no nothing… You just get 100% of your money back if you are not happy. I recently purchased the 5 keys to Deadly Drop Shots training (for an great price) and am really pleased with the results. The training consisted of bite-sized videos that stepped quickly through the elements and techniques needed for an effective drop shot. I found this training formula to be both practical and easy to understand, as there were no lengthy explanations that complicated the learning process. Jim is a great teacher, he is both very experienced and very likeable and he phrases things in a way that is easy to get. After watching the videos, I felt that I totally got the mechanics of playing this finesse shot and went on court doing something with more consistency than I had before. Money well spent then! I enjoyed the 5 Keys videos. A lot is common sense but for me common sense isn't always the court response. I liked the idea of seeing the steps that should come naturally but I need to see before I can incorporate them into my game. I've done some of them and my shots go where I want them to go. When I don't they don't! After a number of years playing Tennis and taking lessons, camps, drills and clinics, I found the 5 KEYS most insightful to my game. The overall points were not the same old thinking and presentation style. I am hearing not just about the HOW but the WHY of a stroke. I am a 4.5 player looking for those little insights that ONLY will provide me to reach the next level in my game. I have only high praise for the helpful and clear packaging of all "5 Keys" products, especially the demonstrations you provide and the brief text. I applied your tips immediately and found improvement. I won't "own" what you prescribe until I hit many shots consistently of course. Thank you again for dependable solid techniques and excellent communication and demonstrations. After diligently playing this wonderful game for over 38 years and also being ranked 11th in Colorado, Mens 4.0 Doubles; I am at a point in my game in which I look for small new subtle astute points to advance to the next level. The 5 KEYS was very insightful, providing those small subtle advances improving my game. Here’s to playing better tennis. Let's get started.